Bird’s-eye view of Tsuwano Castle town during the late shogunate. This illustration shows the entire castle town as it appeared in the time when Kurimoto Satoharu produced the Tsuwano Hyakkeizu. Kurimoto Satoharu drew the Tsuwano Hyakkeizu, which depicts Tsuwano domain’s life at the end of the Shogunate Edo era (around 1868). The 100 drawings were also accompanied by the map of the castle town, and these two can be used as a set, while walking around in Tsuwano. The size of the map is already something to behold as the original 3 scrolls are some 2.4m (7.9ft) long (or high, if you hang them up). 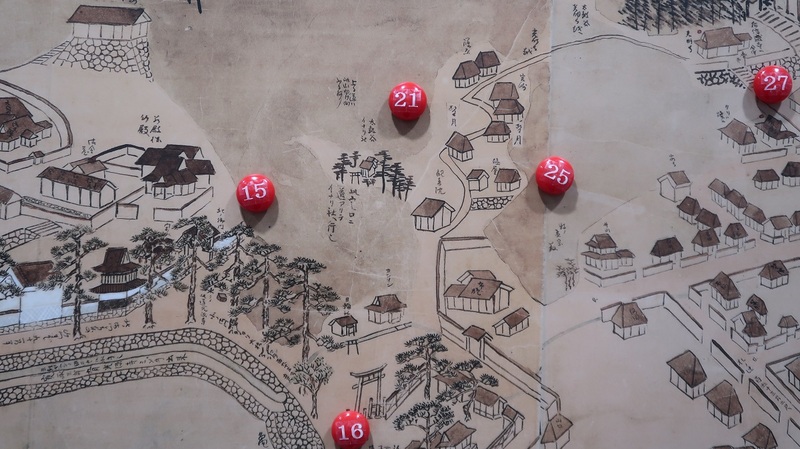 The details and effort that went into creating this maps is also impressive, all the samurai houses have the family name written above them, there are some detailed explanation of festivals (like the Heron Dance) and even some public works (water channels, etc.). Tsuwano burned down many times during its 700 years of history. It is located in narrow valley, where the spring wind is stronger than typhoon in, as the local saying goes. Because of this narrow enclosure with strong winds, if once a fire starts, it spreads all over the town. The last big fire started in 1853, and burned down most of Tsuwano. 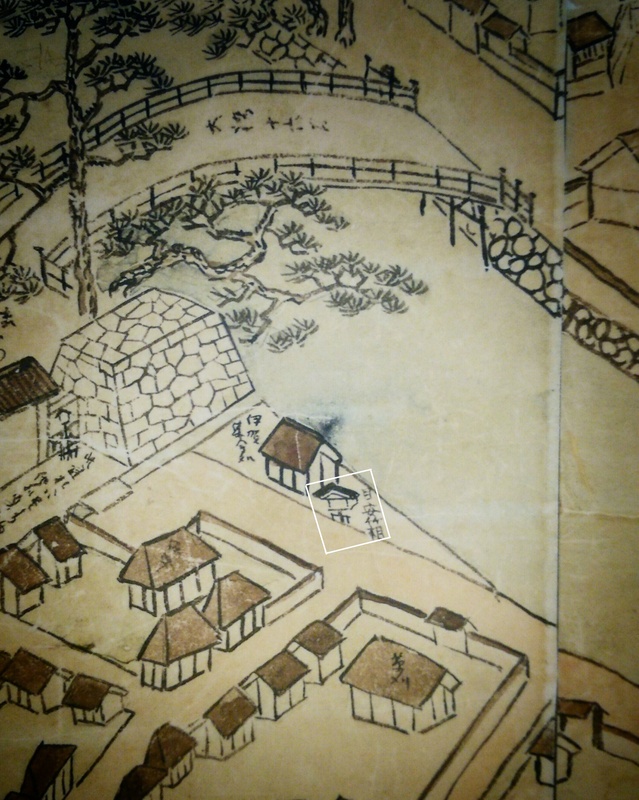 Kurimoto marked the surviving houses on the map, with small red dots above the roofs. Also, one can see some public works to battle the fire, dating back the Edo period (1600-1868). 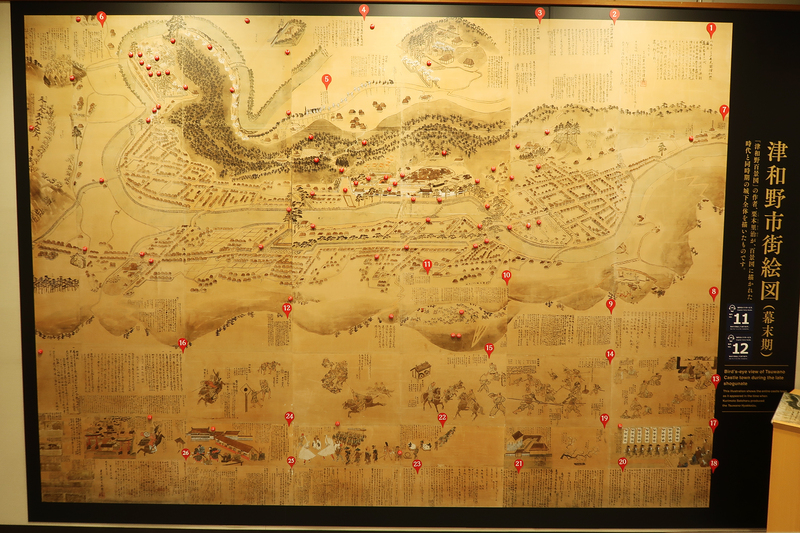 Even in the Edo period, the domain lord created water channels through the city, which intakes can be seen on the map. These water ways were also used when a fire broke out. The other measures against the spreading of fire are the “hiyoke” (火ヨケ) which are plot of land in the town where the building of houses was forbidden. Some of these plots look like abandoned spaces today, but indeed, they were left untouched on the order of the domain lord. The main tower of the castle burned down at the end of the 17th century after a lightning struck it. As is depicted in the Hyakkeizu, the tower was not rebuilt during the Edo period (1600-1868), as the domain lord was living in a separate location (in the Tsuwano Palace). Because of this early Edo period fire, there is only one drawing remaining that shows the main tower standing. While currently Tsuwano Taikodani Inari Shrine is an important point of interest in Tsuwano, it was not always so. In the Edo period (1600-1868) the shrine was in a place where only samurai could pray. After the Meiji period started in 1868, local citizens and visitors from near and far, started to come and pray at this shrine, and gradually it was enlarged to its current form. During the first 3 days of the year, some 100’000 – 150’000 people come to Tsuwano, as the “first shrine visit of the year” is an important one, usually done at an important shrine like Tsuwano’s Taikodani Inari Shrine. 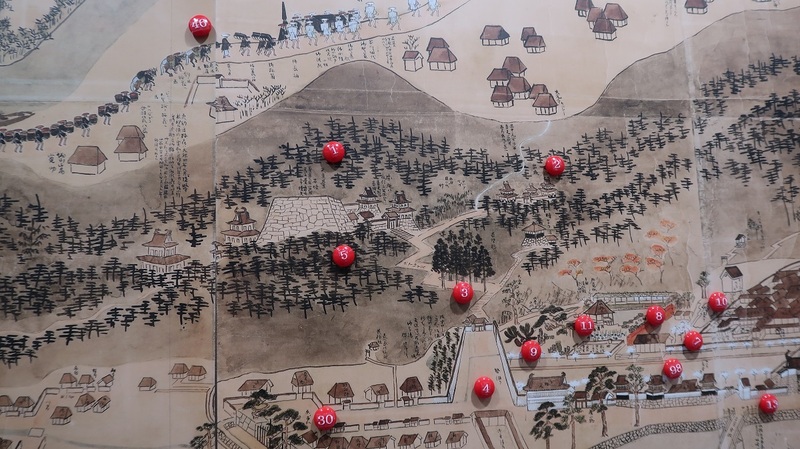 There was a so called “meyasu-bako” (suggestion box) outside of the samurai district gate, as can be seen on the castle town map. The origin of these boxes comes from 1721 Edo, where the shougun created this custom of feedback from the residence of the town. Probably in Tsuwano too, suggestions and comments about the life of the domain was written on paper, sealed and brought to the domain lord. The lock of the box would be opened in front of the domain lord, and he would open each sealed scroll himself. There was also a small house standing next to the box, putting up announcements and watching over the box.